Its a long time since I posted a digital painting. 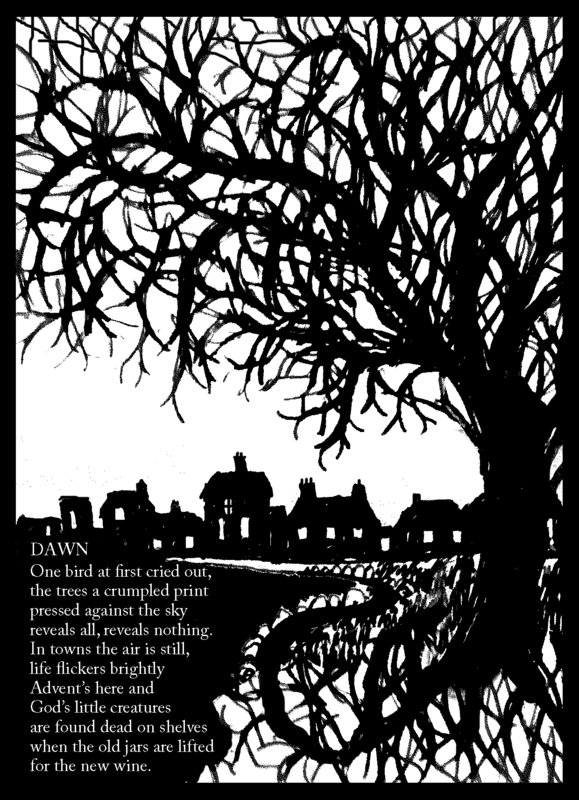 So here is my illustrated poem about the dawn of the day, the dawn of the year and the dawn of Christianity. I’m not a very religious person, but it is Christmas time. The sketch was drawn with a Biro, photographed, and opened in Photoshop. By changing the picture mode from Greyscale to Bitmap the lines were made rough at the edges and the shades of grey were converted to black or white. I then brought the mode back to Greyscale as this allows more scope in manipulating the picture. The text was typed into a separate layer in white and the background layer painted black to show the white text. I did the painting, etc. using the scratch pad on my laptop. A graphics pad would have been a lot easier, if I could remember where I put the pen. In a way I was shamed into doing something different as I was nominated for ‘The Versatile Blogger’ award. 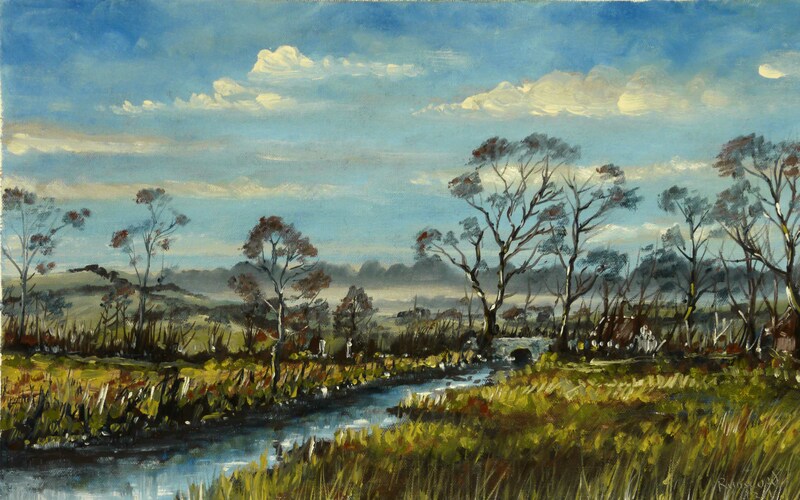 But I’m addicted to landscape painting and I will need a ‘fix’ soon, although it will be hard to detach myself from the Christmas activities of the coming week. If I’m not back before then, happy Christmas to all who read this and see you when the Sun/Son returns. Thank you Elenacaravela for nominating me for ‘The Versatile Blogger’ award. I was hoping, when I started this blog, to be more versatile than I actually am. Its all a question of time, or the lack of it. I’ve linked the production of paintings with the production of the posts for the blog. How long I can keep this up I don’t know. In actual fact, I spend more time on the blog than I do on the paintings. Sometimes I don’t get round to answering the encouraging comments you’ve made (apologies). The long and the short of it is, I really don’t have time to do a good job, especially deciding 15 blogs deserving of the award. But I would like to say a little about the blogger who nominated me. Most of her posts are short, sometimes just a photo of her very interesting art, but this one I really liked. Oil Painting Tutorial is a post almost in the form of a personal instruction on the production of an absolutely brilliant portrait. I found it most informative and helpful and I really appreciate the amount of effort it took to produce this wonderful post. 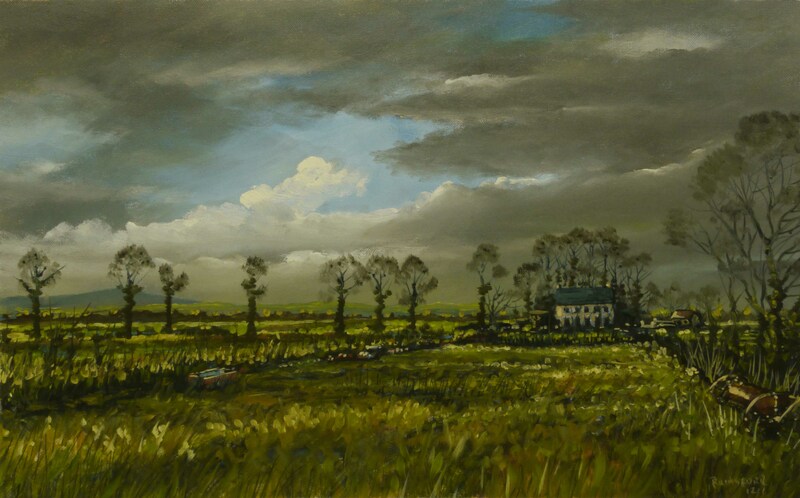 Although the method of painting was the same the different range of colours gave a flavour to this painting which was different from recent paintings. The Indian Red was the main contributor to this change. This colour is very intense when used neat, but dies with even the minutest of additions of any colour. If you are interested in clean colour, and I am, using a colour like Indian Red puts an extra stress on the painting process. By the addition of the 3rd colour to the mix the colour is in the grey range, and a dull grey at that. Before I get to the video, I have to mention the 100 Portraits in 20 Weeks project by Artboy68. I received my original portrait (No. 18) in the post today and its great. I’m a firm believer that art today is a sharing process and this is a very practical way of sharing art. 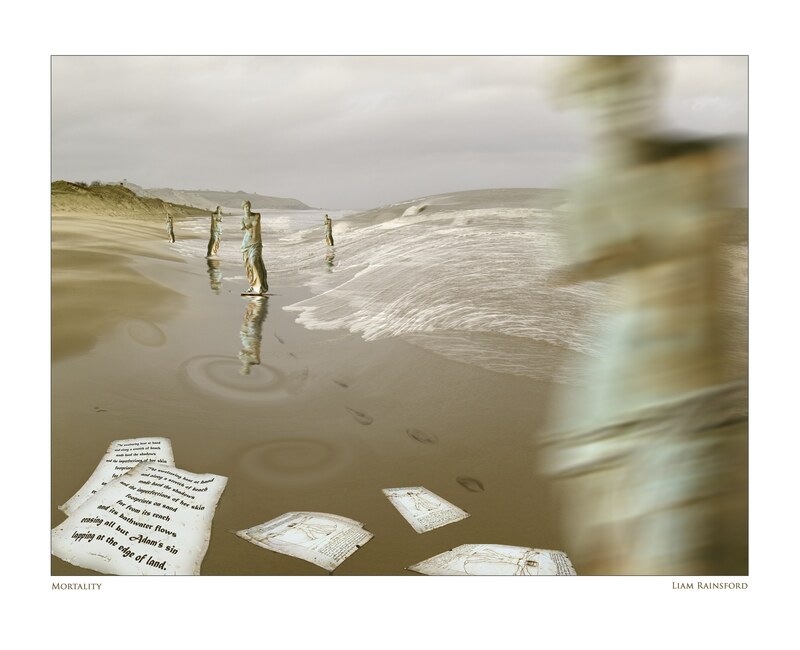 The way the world works and therefore art works has changed, thanks to new technology. 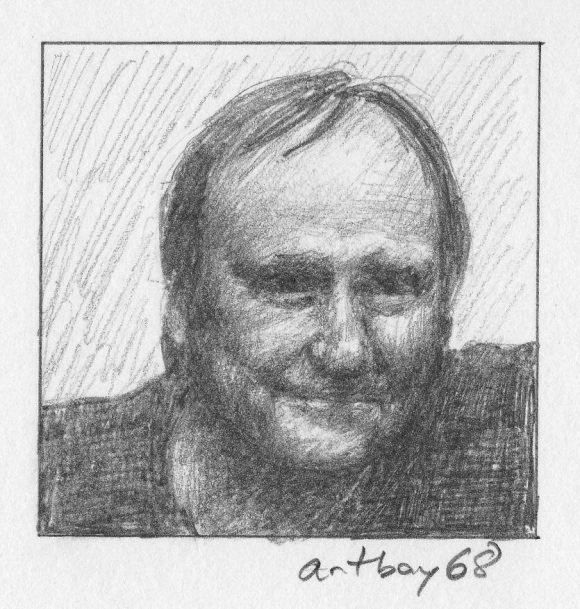 A big thanks to Artboy68 for the portrait. A place connected to everywhere and from where any destination could be accessed, the crossroads would have been a landmark in rural Ireland. Older country people will tell you of the Summertime dances and parties at the crossroads that would last till daybreak. But this is not a Summertime scene. Its the approach of the Winter Solstice. Its daylight, long before the sun rises and only the high clouds are lit by the sun, reflecting a golden glow. Its the end of the old year and the beginning of the new. There is an underlying theme of crossing boundaries in this painting. This scene is based on the crossroads just over the hill from where I live. The little river is a Diocesan boundary (see this post) established exactly 900 years ago this year, but probably based on an even older boundary. I ‘fudged’ the sky/earth boundary on the horizon in keeping with the time of year and this time of day – the long grey wait before the coming of the sun. For many people the beginning of a new year is like a crossroads. Its a time to consider changing direction and resolving to stay on the new path. Irish folklore has many stories concerning crossroads. There is a tradition that if a hen crowed like a cockerel it would be caught, brought to the crossroads to be released unharmed. Like many such practises, you can only guess at the reason for this. There is a complete change in the colours this time. Indian Red, Raw Sienna, Prussian Blue and black and white. Again just 3 colours to ensure clean mixes. Indian red is ‘rust’ colour and produces very dark purple mixes with Prussian Blue. In many mixes it can produce a ‘dirty’ colour, like that ‘mucky’ brown mixture that always seems to be on the palette when you finish a painting. But with Prussian Blue and Raw Sienna its OK. The purple, when mixed with the blue, is not reproduced well in the photograph or the video. It appears as black, as in the line of trees going over the hill on the left in the distance. This is a photographic limitation that does not do justice to the painting. You might think there is a lot of work in background areas which are covered up in later stages of painting. I like to think of this as keeping the options open. As a painting develops, it may be necessary to leave something out which you planned to include. Trying to fill a gap at the later stages of a painting is a lot more difficult than putting it in to start with. I will have the video ready for posting in a few days.